Young and innovative New Zealand company, Wishbone Design Studio, is achieving impressive export success focusing on productivity and global reach. After 3 years in operation, Wishbone is now selling its award-winning products in 4 continents and 36 countries. Wishbone Design Studio was created 3 years ago by New Zealand couple Jenny McIver and Richard Latham. Their goal was to make stuff of enduring value that adapts to the evolving needs of families – items that change the way we think or play and become heirlooms, handed down to family members and friends. 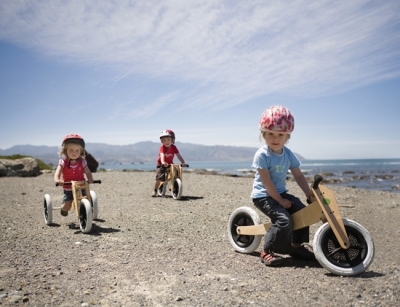 Its sustainably designed product range has recently increased to 3 with the launch of the Wishbone Flip, a 3in1 rocker, push-toy and ride-on, adding to the Wishbone Bike and the Wishbone Bike Limited Edition. Sustainable design and manufacturing is a must for Wishbone Design Studio. They have carefully assessed the materials, processes and standards used by their manufacturers, to ensure they fit with Wishbone Design Studio’s social, ethical and environmental objectives. Wishbone Design Studio is committed to measurably improving their environmental performance year by year. Standing by their values Wishbone Design Studio have recently become the first toy manufacturer globally to become a carboNZero certified organisation. The latest addition to the Wishbone Family - Released in July 2011 the new Wishbone Flip is brilliantly simple, offering 3 toys in 1 – its innovative flipping mechanism transforms the Flip from rocker to push toy to ride-on in seconds. Wishbone Flip fulfils on the same promises as the Wishbone Bike – to delight children aged 1-5 while reducing overall consumption and delivering a positive environmental outcome.